Special coffees, for real coffeelovers. An exclusive mono origin of washed arabica, for the most demanding and sophisticated customer. 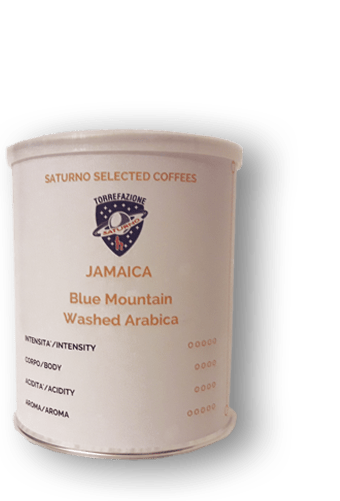 It is considered the perfect coffee for it’s total lack of defects, the look of the beans and his vast and complete organoleptic result: a full body cup, it’s medium to high aromatic acidity and a perfect balance between floral impressions, honey, fresh fruits, dry fruits and spicy notes. We offer a great Type 1 (bean dimension not lower than 18 of sieve), from Wataru Blue Mountain Farm. This fantastic washed Arabica classified SHB Strictly Hard Bean ( this shows that the plantations are between 1500 and 1700 mt of height), is cultivated on the highlands of the region of Piedra de Candela, on the Costa Rica borders. The look on the cup is impeccable: it has no defects as it is selected by hands. Into the cup it’s a full-bodied, balanced, with the typical sourness of the Central-American washed, the taste prevail of floral notes, malt, and citrus fruit. In the plantations where this coffee is produced, there’s not use of child labor, for which is expected a free school program supported by the manufacturers in cooperation with the buyers. This single origin natural arabica “gourmet”, comes from the region of Cerrado Miniero, in the North-West of the Brasilian State of Minas Gerais. It is cultivated on an extinct vulcanic ground, at 800 to 1000 mt. of altitude above sea level. It is one of the most appreciated variety of this coffee by the true coffee connoisseurs for its organoleptic quality. It owns an intense aroma with remarkable ripe fruit notes, dry fruit, chocolate, caramel.